In the months before and after her second birthday, Clover began experiencing another fear period. Suddenly, she began having issues with things that never bothered her before. In hopes of easing her through a tough time, I had the opportunity to try Innovet PurCBD+. Here is my dog product review of this CBD oil for dogs. Yep! This is a sponsored post. However, all decisions about what to say and how to say it are my own. This CBD oil is human / medical grade Cannabidiol oil formulated for dogs and cats. It does NOT give pets a “high” because there is virtually no THC in it (0.3%). It’s legal to buy and use anywhere, not just in places like Colorado where pot is legal. UPDATE AGAIN – March 3, 2017 – The company can once again ship to any state. People (both at home and in public), but only if they DO NOT have dogs with them. People with dogs are great. She barks and acts afraid of people without dogs. We’ve tested this theory both with people visiting us at the house and in other spots, and it’s clear that having a dog makes a difference. Alas, having Tori as the other dog does NOT help … because she just feeds off Clover’s nerves, then they both bark and worry. Waiting in the car in her crate alone in public. As weather allows, I’ve left Clover in the car for short periods in the past with no problems, but recently, she gets restless and barks. Running across the dog walk and teeter at agility class. Months ago, she would speed across the dog walk without a care in the world — even at full height. But, lately, she has to be cajoled across. This is usually a teeter-related issue, but she has been doing the low training teeter fine. Even when we put a low teeter and a low dog walk side by side, she can’t seem to see and feel the difference yet. In general, Clover has seemed more worried in the months before and after turning 2. 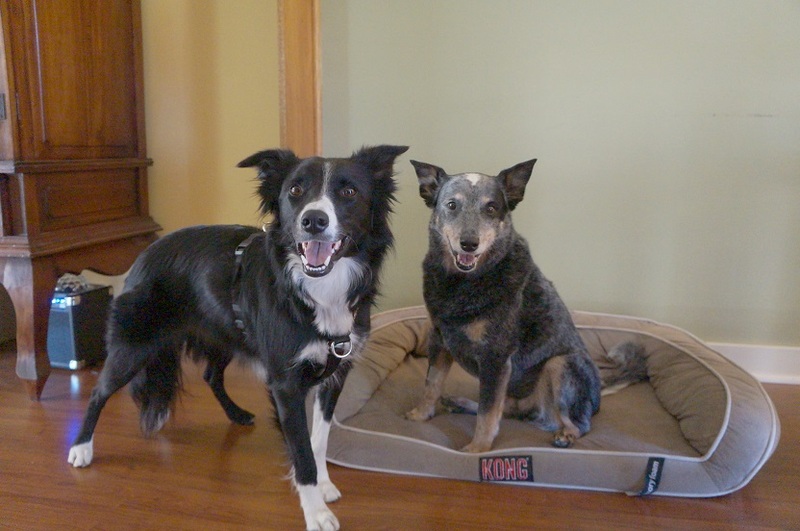 It is NOT uncommon for dogs — especially herding dogs — to go through a bit of a fear period at this age, so I’m not super worried, but I do want to help her as much as possible. SO, I’ve added Innovet PurCBD+ to the supplements she takes each day. She has been taking the drops now for several months. It took me a while to figure out how to give the drops. My BEST tip, dispense the drops onto a spoon and have your dog lick them off. That way you’re not waiting for it to get into the system via digestion (if you put it on food). And, it’s easier than trying to dispense the right number of drops directly into the dog’s mouth. I just say, “Clover come get your drippity-drops,” and she runs in and licks the CBD oil right off the spoon. I give it to her in the morning, after breakfast. The dosage is 1-2 drops per 10 pounds of body weight, so we started at 3 drops per day for a few days (as recommended) before going up to the full 6 drops for her 35 pounds of body weight. It does NOT make her seem loopy or stoned — again since it has virtually no THC in it. 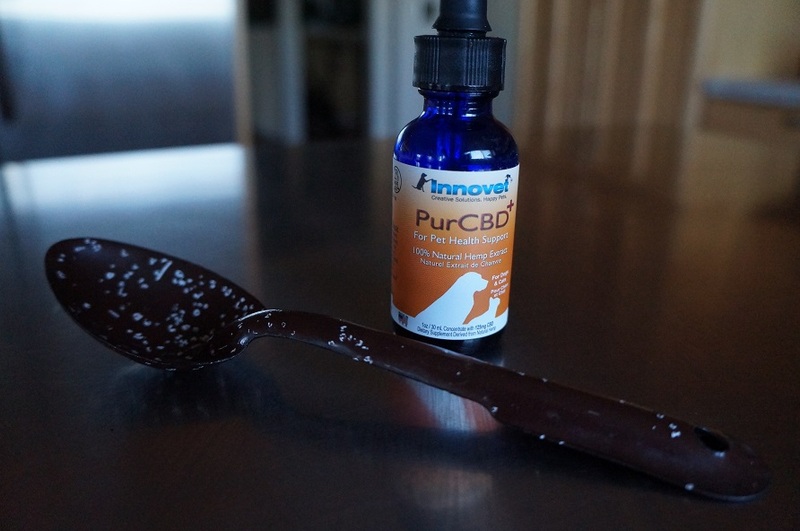 The Innovet CBD+ simply gives her a nice undercurrent of calm and stability emotionally. One of my agility classmates has been using CBD oil also and swears it is helping her dog’s skin and coat. She has been more focused and responsive at agility, even though her teeter and dog walk fears still need work. We are making progress. 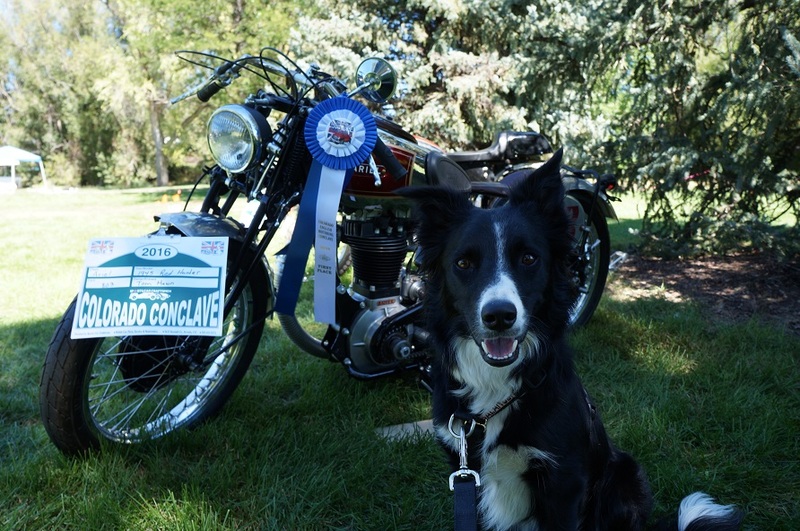 She did really well at a big motorcycle show in September — even with hoards of people, loud motorcycles, loud music (including bagpipes), several guys taking a tent down right behind us, etc. She still only wanted to meet people who had dogs with them, but she sat with me smiling and relaxed throughout the the event. She handled going to see our veterinary chiropractor / veterinary rehabilitation doctor just fine a couple weeks ago. We met at the vet’s house. It definitely helped that our vet’s dog was there too, but in the past, at the veterinary hospital, Clover shriek-barked the entire time. As you can see, she had a grand time. We tried using the Innovet CBD+ for Tori’s ongoing insomnia. She gets Tom up 1-3 times per night. It did not help, but we’ve also recently tried valarian drops (on our vet’s advice), and that hasn’t worked either. So, it may just be more habit at this point than anything. We also tried it for Tori’s unrelenting carsickness. We’ve only given it to her once, but we drove all the way to our main veterinary hospital for her exam and rabies vaccination a couple weeks ago, and she made it all the way there and *almost* all the way back home before she threw up. I was ready to declare victory, but about 1.5 miles from home, she barfed. Still, that’s the farthest she has ever gone before throwing up. Progress! With Tori, we will only use it as needed. With Clover, I plan to continue giving the CBD oil to her daily. Yes, I did talk to our main veterinarian about using it, and she gave it the OK.
Want to Try Innovet CBD+ Yourself? It’s made from all natural hemp product, sourced from Northern Europe, and it’s tested for quality, safety, and efficacy. They offer a 30-day money back guarantee (even if the product has been used). What a shame that this can only be ordered in California, this could help so many pets and may be better and more affordable than may pharmaceutical drugs. It is really disappointing, Lindsay, that the rules have suddenly changed. I’m hopeful they will change back … since there is almost no THC in CBD oil, it seems silly to limit it only to states where pot is legal (like CA or CO). When we run out, I’ll be able to get a different kind locally, but I’ve been really happy with how it’s working for Clover’s fear period. Thanks for letting me know, Lynn. I’ve updated the post and contacted the company. I’m glad it it’s working for Tulip, but I’m sorry you were not able to order more. I guess I’m glad I got my next order in before the cut-off.